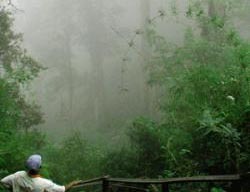 In 2003, three road investments were proposed in the vicinity of the Barú Volcano National Park in the province of Chiriquí: (1) a one-lane road from Cerro Punta to Boquete, via the Park; (2) the so-called “southern route” outside the park, from Cuesta de Piedra to Boquete via Palmira; and (3) paving the access roads as far as the guard stations at the Park’s Eastern and Western entrances (see figure 2). Conservation Strategy Fund (CSF) and The Nature Conservancy (TNC) conducted an economic analysis of the proposals between February and April, 2003. We employed the “Roads Economic Decision Model,” developed by the World Bank in 1999. The research was jointly funded by the Nature Conservancy and Conservation International (CI), and was one of several factors that led to cancellation of the proposed road through the park. The lower-impact "Southern Route" was selected instead. Our finding was that Cerro Punta-Boquete road is economically infeasible and would represent a net loss to the Panamanian economy, even before considering environmental costs. Our base case envisioned 250 vehicles per day, traffic equal to around 25 percent of that on the main two-lane paved roads linking Cerro Punta and Boquete to the Inter-American Highway. This scenario yielded a net loss of $808,000 to the national economy in the first 20 years of operations. In order for the road’s to have been feasible, an average of 364 daily vehicles would have been needed in the first year, over 500 per day by its tenth year of operation and 657 in twenty years. Large hourly, daily and monthly variations would have occurred, meaning that maximum traffic would have been significantly higher than the average. These levels of traffic are incompatible with the road’s “ecological” concept, which is to allow motorized transportation to the zone without degrading the ecosystem or harming its species, and without precluding peaceful contemplation of nature. Instead, the effect would have been regular bottlenecks and accidents within one of Panama's most visited national parks.